I've just installed Kali Linux (Debian) in a VirtualBox VM. I want to install the VBOX Additions that will allow me to configure things like screen resolution (hopefully). My problem is running the install script. I'm root, I've chmoded everything, I have the rights to execute the script but I still get 'Permission Denied'. I've tried with sudo as well. Alternatively you can copy all files to disk and run the scripts from there. 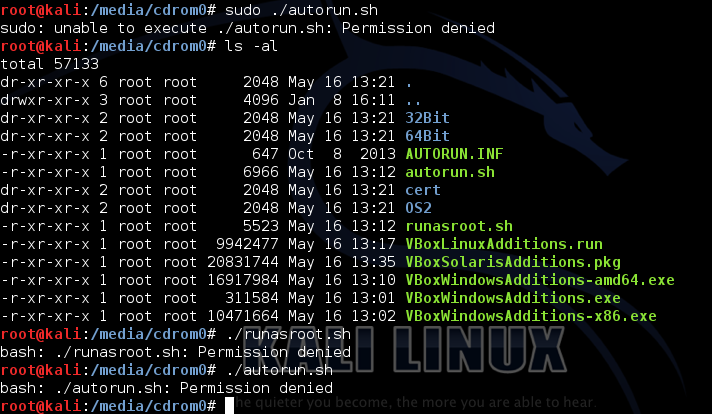 The file you want to run is VBoxLinuxAdditions.run , the files named runasroot.sh and autorun.sh will return that error even if you do change the attributes. After you copy the contents of the Guest additions ISO to a folder on the guest machine if it appears in green text when listed in a terminal then it is already executable. If not you can type into a terminal after navigating to the directory where you saved the files on the guest machine. chmod -x VBoxLinuxAdditions.run or just right click on it and select properties and then select the permissions tab and click the execute checkbox - allow executing as a program. Change the permission of the file system in which the *.sh file is located. Not the answer you're looking for? Browse other questions tagged linux virtualbox permissions or ask your own question. Problem with running a script at startup as root?